My bookclub has been running for over ten years – when we started a group of eight of us had to each bring someone the others didn’t know. The idea was to make new friends ad it has certainly worked. People have come and gone but we’re still going strong. In December everyone brings along a second hand book they lve (maybe a childhood treasure) or have enjoyed and we do a secret Santa swap. I’ve read some amazing books this way and gotten to know more about my friends’ tastes and history. We also do a trivia quiz based on the books we’ve read that year – sadly I never win! I started this long before my daughter could read. Instead of chocolates, every day in December we’d unwrap a Christmas book. I saw the idea back when the internet was young and Facebook hadn’t even been imagines and seized upon it. We moved from picture books (though some always remained – our firm favourites – our good friends) to chapter books. She’s now just shy of 18 and I kept it going until she was 15… I still miss it, I won’t lie. I also started it with friends and would buy their kids new books each year and deliver then Dec 1st. (Always fun to play Santa and encourage reading) So much fun! So many memories. The annual Boxing Day Book. I don’t care what I get for Christmas as long as I get a good book. A book I can lie in my hammock and read on Boxing day as I nibble on leftovers and a nice cocktail. This tradition is all about me. Sometimes I put in a request and sometimes I am given a rare gem I wouldn’t have discovered otherwise. Like most mothers I’m exhausted by Boxing Day and I deserve a treat. What could be better than that? Do you have any bookish traditions I could embrace? When Zara’s boyfriend can’t come home to Sydney from New York for Christmas she decides to go to him instead. Sure, the ticket costs a bomb, and her overbearing family thinks it is a bad idea, but that’s what you do for love right? Or so she tells the tall and hunky ex-basketball star, Kyle who is squeezed into the plane seat beside her. But when a blizzard hits and she finds herself snowed-in in Denver a few things become clear – her boyfriend isn’t that heartbroken about her absence, the airport doesn’t seem like a very festive place to spend the holiday and there aren’t anywhere near enough pumpkin spiced lattes to fix the situation. So, when Kyle offers to take her to stay at his buddy’s empty house, she decides to take a chance and make the best of her first white Christmas. What she hadn’t banked on was Kyle’s ex and a reality television crew crashing the Christmas party. 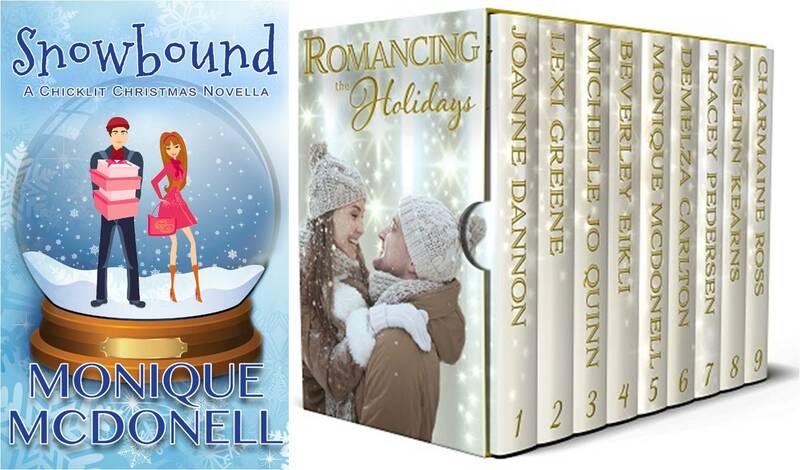 If you like fun and flirty heroes, ugly sweaters, snow covered mountains and sugar cookies, you’ll enjoy reading Snowbound these holidays. Curl up by the fire with a glass of mulled wine or hot chocolate and celebrate the magic of Christmas with these nine heart-warming stories about love, hope and family. There’s something for any reader who loves the romance of Christmas. These sweet novellas are a perfect way to unwind in the busy the holiday season, so pick up your copy today!